Ms. Celiac Says...: Jamba Jamba! This week in NYC, we are experiencing some unseasonably sunny, warm weather. I figure that this makes it the perfect time for a nice, cold, icy treat. If you're thirsty, warm, are craving something sweet, or just need some antioxidants then head on over to Jamba Juice! Jamba Juice has 36 gluten free drink options and 15 of those are dairy free, as well. All of their smoothies are gluten free with the exception of Pomegranate Heart Happy and all of their boosts and super boosts are gluten free with the exception of Daily Vitamin, Energy, and Heart Happy. And for those of you that are gluten free vegans, you have 14 delicious drink options! Jamba Juice is located in AZ, CA, CO, DC, FL, HI, ID, IL, IN, MD, MA, MN, NV, NJ, NY, NC, OK, OR, PA, TX, WA, and WI. 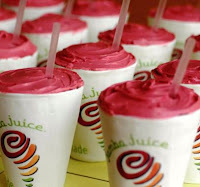 For exact locations in each of these cities, visit their website at www.jambajuice.com. For more information, visit www.jambajuice.com.